Although I simply love fishing, I have to admit that I have become a little obsessed by the humble flathead. I blame the team here at Fishing Monthly when I arrived. They caught a lot of them and it was pretty tough not to get involved when most trips involved being connected to lots of fish in the 50cm+ category. My arsenal of rods to target them has gone from a single outfit to at least six, with a few failed outfits in between. I have been striving to find what I consider to be the perfect flathead outfit. The key features being: it must be a minimum of 7” long, have a rating in the 2-4kg or 2-5kg range and be a fast or medium fast taper (at worst it must be powerful enough to get that hook through the top jaw of a flathead). Cost in many ways is also a factor. There are plenty of top end rods that would be amazing to use, but flathead are a bread and butter species, and I don’t believe a $1000 outfit is required. Additionally, money saved on a rod means more can be put into a reel, which makes more sense to me. I have come close on several occasions, rods have been 85% there, but in the end the taper or power to bend ratio for me has not been right. Too stiff and the hook set is great, but the finesse at the end of the fight is lacking and fish are lost. Too slow a taper and the hook set power diminishes and fish are lost (on larger fish) with the hooks not finding enough purchase. This is where the Team Daiwa Hyper rods come in. I am always on the look out for a distinctive looking rod with the above attributes and the TD Hyper series of rods caught my eye. A quick call to Grayson Fong (a Daiwa pro angler who is using them) to get the good oil on them convinced me that they were worth looking at. I decided on the 701LXS model and matched it with one of the new Daiwa Sol III LT reels. The first time I used the outfit wasn’t chasing flathead. I teamed up with Grayson and headed to the islands in southern Moreton Bay chasing tiger squid. Far from what I had purchased the outfit for, but the beauty of a 2-4kg outfit is that it translates to throwing lures for bass or jigs for squid. 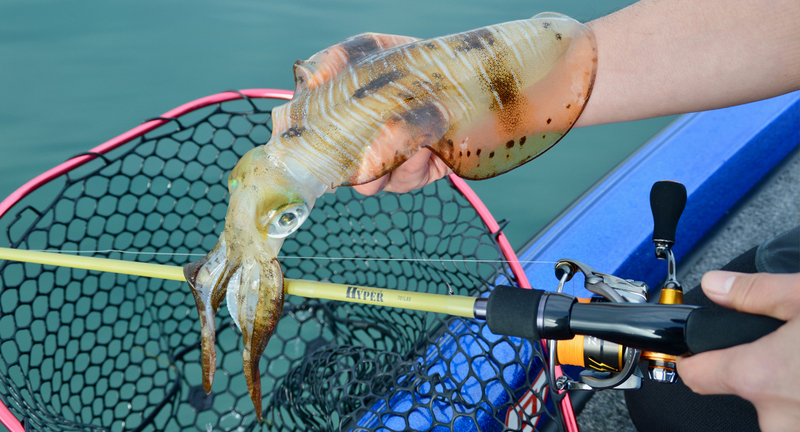 The rod was christened on a stonker squid and has since done battle on a number of flathead. he TD Hyper rods seriously feel as light as a feather. 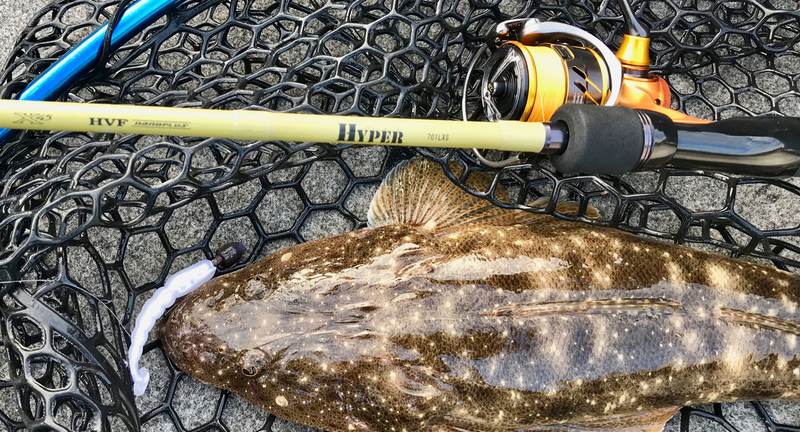 I don’t have another rod in my gaggle of rods that gets close to the weight of the TD Hyper. Matched with the Sol III LT reel (also a lightweight design) and you have something that is pleasure to use all day every day. Power so far has not been an issue, with several solid flathead putting it through its paces. I am not quite so sure how to express this into words, but the power seems almost effortless. Much of the marketing around this rod range has been about the HVF Nanoplus graphite and X45 blank technology. The combination of the two technologies creating a lighter and more dynamic blank for the rods to be built from. This also translates into the casting ability of the rod. Size 3.0 squid jigs and 3/8oz jigheads have been cast easily. One tip however is to ensure the hook keeper is kept facing downwards when you are casting. I have had the line loop and catch onto it when I haven’t, which can result in lost tackle. I love the fact that the keeper is there, but just have it facing down when you’re not using it. 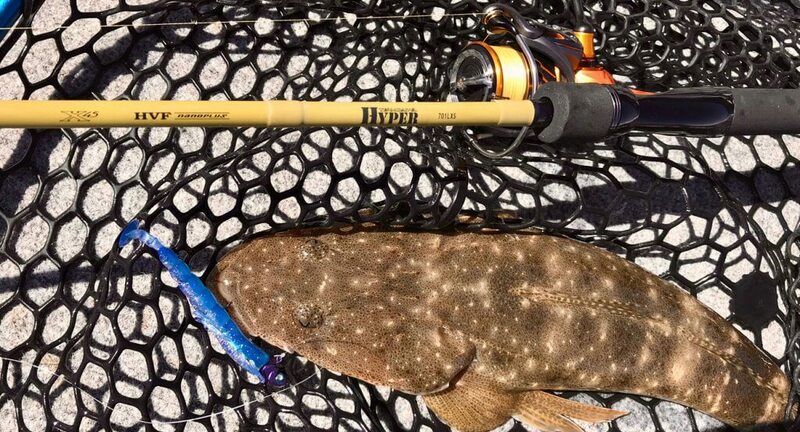 The author chose the TD Hyper 701LXS rod when looking for a rod to target flathead. He matched it with a Daiwa TD Sol III LT reel and is very happy with it so far. If how light the TD Hyper rods are is impressive then their value for money is exceptional. In my travels and during the obligatory visit to the local tackle store, I have consistently seen the TD Hyper rods selling for $129.99. This is not the price point I would expect to see the quality of this rod in. There is also a reasonable range of options within the TD Hyper range. There are 11 spin and 3 baitcast options covering the majority of your fishing needs. Have I found the perfect flathead rod? I am not prepared to say that as yet, but I am happy to say that I am closer than ever. It will definitely get plenty of use over the next few months, as it is prime flathead time here in South East Queensland. Aside from what I have already said, the one thing that the TD Hyper rod has changed my thinking on is Nano Technology based rods. You cannot question the additional strength, power and resilience Nano resins add to any blank, however in most cases this is at the expense of the taper of a rod. Certainly not the case with the TD Hyper rods and definitely something I prefer and look for in rods.